I saw this product used for a few Gen Con games so how did it go. Any players want to speak. I think it is great if someone makes a product and then runs it at a major con. For example, I bought a lot of Viligance press WWII stuff and playing in a few WWII type golden age games would have been neat. I didn't get to go to Gen Con though so if someone has a comment, review, whatever let's hear it. Foreshadow wrote: I saw this product used for a few Gen Con games so how did it go. Any players want to speak. I think it is great if someone makes a product and then runs it at a major con. I dig the idea of getting some gametime in using the WWII golden age games, myself! I'll see if I can't set up a pick-up game or two at Dragon Con and AWA next month... if it works out. So! John... when can we get you on the Vigilance podcast? Gotta love Dan's stuff, it keeps getting better and better! Just purchased the whole Hope Prep series. I've always enjoyed the "hero high" premise, and Melior Via totally gets the fun and spirit of the subgenre. I don't buy many pdf products, but I felt the four Hope Prep supplements were well worth it. Solid narratives, but with enough flexibility for the GM to insert his own NPCs and subplots. I especially like the section of notes after each scene to help prepare for when PCs go off in unexpected directions. Whole bunch of overdue responses - I don't seem to be getting notifications when people post. Thanks for the kind words (and the purchase) maddrmark! I hope you get some good games out of it! It's a genre that I love and that I'm thrilled to play with. Shadowchaser - you've got e-mail. I'd love to join in on a podcast. Foreshadow - We had ~40 players show up for the 48 available seats over the course of the con. (They were sold out, but sometimes things come up.) The players all seemed to have a good time, but I haven't seen any postings anywhere with individuals mentioning the games in con reports. If I do see anybody mention their experience, I'll make sure to stick a link up here. 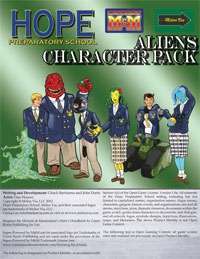 The Aliens Character Pack for Hope Prep is now available on DriveThruRPG. 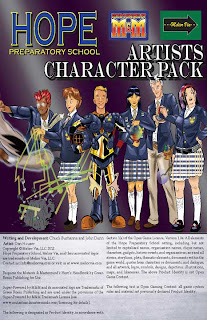 This features 6 student members of the Aliens Clique. Two each of Sophomores (PL8), Juniors (PL9), and Seniors (PL10). 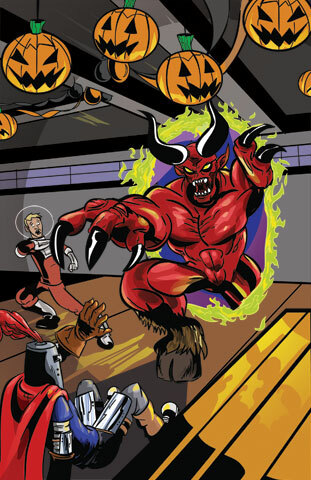 This one also features Dan Houser artwork. I've been swamped with non-Supers freelance work for the last several months, which is why there's been such a delay on this. In better news, though, HPS #3 - Field Trip is currently in editing. I'm hoping it won't bee too terribly long before we can have that up for sale too. Thanks for the support, and good gaming! Re: Hope Preparatory School for M&M - Back to School Sale!